"Dance brings friends, feelings of real well-being, connection, vitality, awareness, purpose, and happiness in the world and with the world. As Aldous Huxley wrote, "It is with their muscles that humans most easily obtain knowledge of the divine." When I was growing up in the USSR, all afterschool activities, art and dance classes were available to all kids at no cost. So, it gave me and everyone else real freedom to explore, try, and choose: drawing, swimming, gymnastics, tennis, folk dancing, ballet, chess, and more. This experience largely defined for me the ambiguous term freedom. I decided to study comprehensively various forms of dance, movement, music, and theatre at the legendary Russian dance academies in Moscow and Perm. Concentrating more on the classical dance in the end, I graduated with highest honors, dancing the main role in the ballet 'Swan Lake.' While performing with Moscow Festival Ballet, Perm Opera, Kremlin Ballet, and Stars of Bolshoi, I had a chance to travel and see the world. About the same time, I started teaching dance. When the USSR was taken apart, like millions of others, I was forced by the social and political chaos of Perestroika to move abroad. By chance, though influenced by the propaganda, I landed in the US. In the new land, I was eager to explore the culture and learn new forms of dance and movement. Seeing that performing arts, especially ballet, were turning into "the playground for the rich," I was keen to discover another way to live with dance. I found it necessary to study American history, psychology, history and sociology of arts and dance and received my MA from the State University of New York. All of the studies allowed me to understand better numerous functions of dance in different societies, including the US. Moving to New Paltz, I worked locally with NPSB, Vanaver Caravan, Figures in Flight Dance Company, and others; at the same time, I explored various forms of yoga and completed Hatha yoga teacher´s training program. Yoga deepened my understanding of movement and dance too. During this time, visiting frequently New York City, I was also introduced to swing and salsa and liked it, but, when my best friend Sasha took me to a tango class, I was totally captivated. Tango is very unique and can be compared, as art historian R. Thompson notes, "to the black music called jazz." Like jazz, tango is an improvisation-communication: it relies not so much on freedom but dependence and contact between people. Tango requires the very special and real connection, attentive listening and "tuning" to another human being. This is what appealed to me so much. I felt like tango still carried out the primordial, deep and indispensable functions of Dance. As a multicultural person, versatile dancer, and thoughtful dance teacher by years of training and experience, I had some advantage when it came to tango. It came easier, like adding one more language to the repertoire of six. What were my strongest influences and inspirations? Crowds of dancers in Buenos-Aires! In Argentina, I loved to watch and imitate old milongueros at the afternoon milongas, and I was particularly taken by Marcelo Varela and Analia Vega, because they were remarkably attentive, kind, and caring dancing tango together. In the US, I learned a lot observing Dario Da Silva´s cat-like movements. My favorite online influence is Chicho Frumboli, his creativity and musicality. My most important tango teachers were and are my dance partners and students. I am incredibly grateful to all of them for their patience and support. Thank you to my husband Jan for his continuous encouragement. And, of course, many-many thanks to Ellen Chrystal and Carina Moeller: I am continuously learning from them. With my background, I was lucky and did not have to spend lots of money on expensive tango classes. 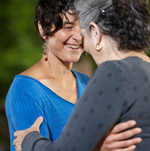 Very few people have my background and options, and this is why we do everything possible to keep tango classes in New Paltz affordable: contribute what you can, full honest presence is enough. People with no or very little money invented and developed tango, and people that have very little or no money should be able to dance tango today too. Dance is for all!